CMM Programmers work for the manufacturing settings to set up and maintain Coordinate Measuring Machine – CMM. Job responsibilities for CMM programmer normally seen on the Resume Sample include coding for CMM Machines, coordinating and scheduling works for CMM machines, coordinating data files using CMM programming, employing CMM operator mode, maintaining CMM prevention maintenance program, supporting CMM operations at other paragon facilities, preparing backup CMM accessories, extensions and CMM hardware. As a CMM programmer, the candidate also takes charge of conducting product audits, reconciling discrepancies, inspecting components, programming machines and developing algorithms and flowchart. The key skills needed for this post are to have a good understanding of CMM duties, in-depth understanding of COBOL, JAVA, C and C ++, knowledge of gage calibration and an ability to communicate technical information. 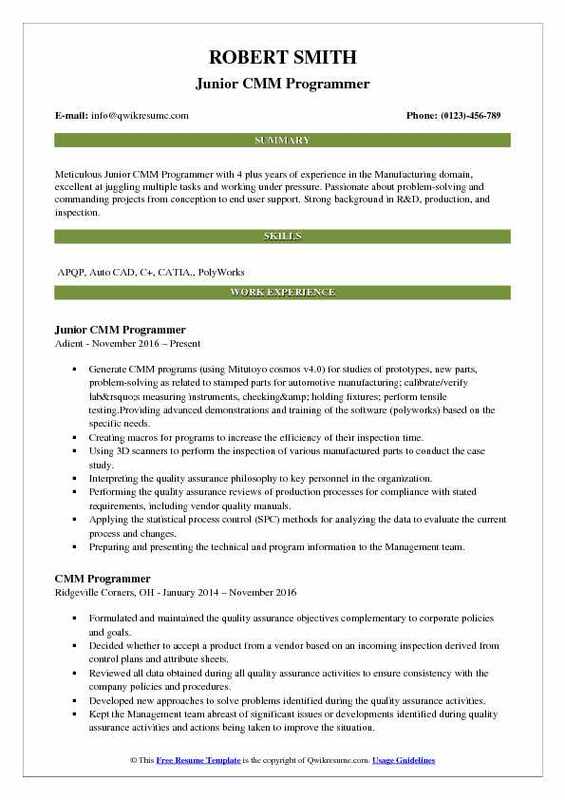 To make an impressive career in this field, CMM Programmer Resume should showcase a High School Diploma with an advanced training certificate in this field. 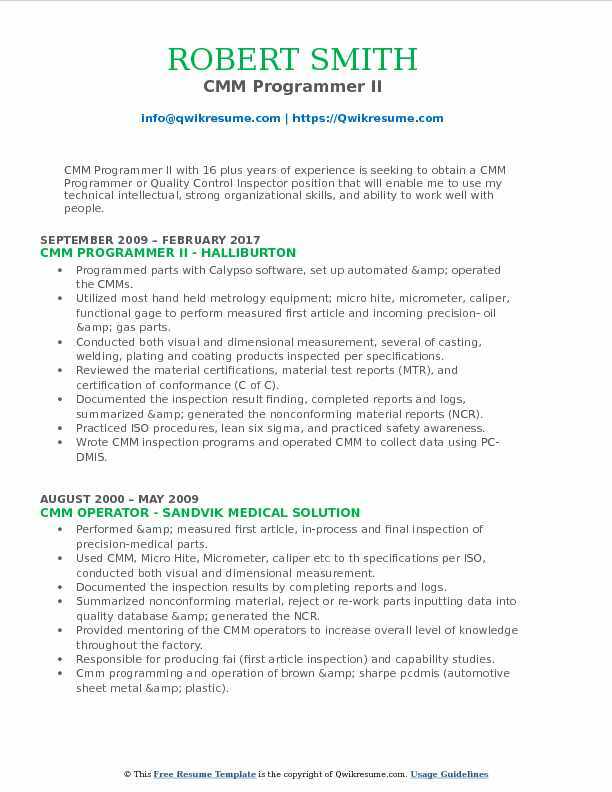 Objective : CMM Programmer with 2 plus years of experience in the Manufacturing domain is seeking a full time position as a CMM Programmer. I am a very meticulous and business oriented individual who is prepared to apply capacious technical and interpersonal skills to the advancement of my potential employer. Programmed coordinate measuring machines utilizing pc-dmis 2017 r2 software. Inspection findings are put into spreadsheets and/or documented into ms powerpoint presentations given to the customer. Inspection is accomplished by layouts, intricate table set ups, and cmm machines. Performing acceptance inspection requiring an in-depth working knowledge of metals, castings, forgings, weldments, plating, plastics, and rubber compounds. Thorough knowledge of machine tool work, mechanical theory, geometry, trigonometry, us and foreign blueprint dimensioning systems, gear geometry, gear clusters, and geometry of many types of threads is required. Working primarily on intake manifolds, sheet metal components, full assemblies. Performing calibration and certification on a variety of final acceptance and in-process gages, tools, jigs and fixtures, and other measuring equipment, extensive knowledge of statistical process control charting and problem-solving techniques for product acceptance purposes. Providing product inspection data and technical inspection expertise for use in serial evaluation committees. Reporting the deficiencies in drawings, gages, and CMM programs including possible corrective actions. 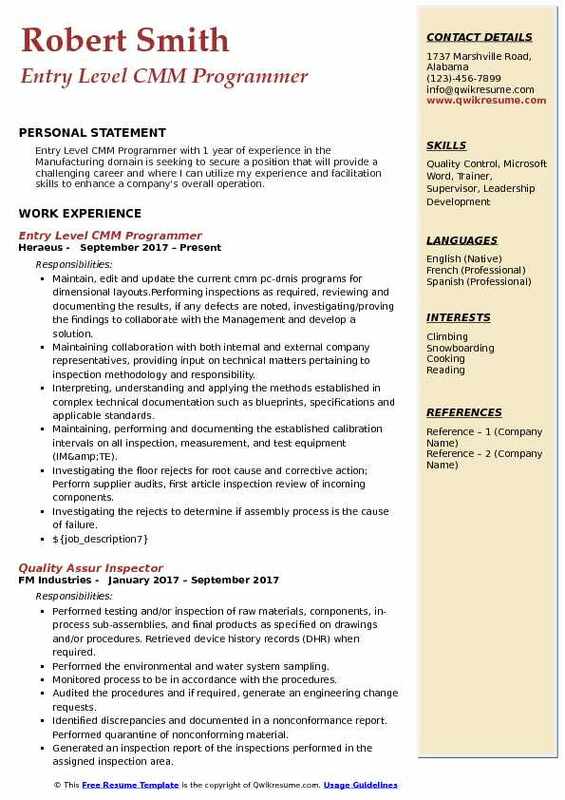 Involvement of production methods/processes, measurement/test techniques, and SPC techniques required to ensure conformance of products or quality programs and serving as technical representative on acquisition QA matters. Objective : CMM Programmer with 3 plus years of experience in the Healthcare domain is looking for a long-term challenge with a stable company that offers an exciting work environment with advancement opportunity for this educated, motivated, hardworking individual. Skills : Arm, Auto CAD, CAD, CMM, Unigraphics. Programming four brown and sharp global classic CMMs with Reinshaw sp25m scanning probe. Applying the appropriate inspection and testing methods, including special techniques, equipment, fixtures and facilities, to the CMM inspection process. Sampling for incoming inspection, in-process inspection, final testing and inspection of finished products. Working with the Contract Manufacturers, major suppliers, and third party suppliers to resolve non-conforming product issues. Maintaining the tools and equipment to ensure they are in good working order. Suggesting and implementing the changes in inspection procedures, quality assurance standards, equipment and gauges to facilitate inspection and testing required and maintaining the quality as necessary. Ensuring the timely flow of material throughout the inspection and test process. Writing the inspection instructions for engineering and quality assurance approval per applicable quality plans. Completing the activities in accordance with the internal procedures and external requirements (e.g. ISO, QSR). 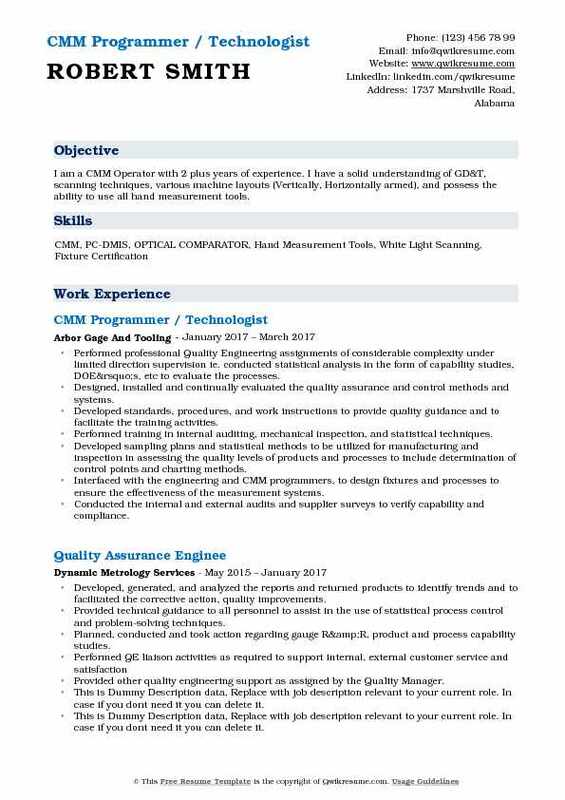 Objective : Meticulous Junior CMM Programmer with 4 plus years of experience in the Manufacturing domain, excellent at juggling multiple tasks and working under pressure. Passionate about problem-solving and commanding projects from conception to end user support. Strong background in R&D, production, and inspection. Generate CMM programs (using Mitutoyo cosmos v4.0) for studies of prototypes, new parts, problem-solving as related to stamped parts for automotive manufacturing; calibrate/verify lab’s measuring instruments, checking& holding fixtures; perform tensile testing. Providing advanced demonstrations and training of the software (polyworks) based on the specific needs. Creating macros for programs to increase the efficiency of their inspection time. Using 3D scanners to perform the inspection of various manufactured parts to conduct the case study. Interpreting the quality assurance philosophy to key personnel in the organization. Performing the quality assurance reviews of production processes for compliance with stated requirements, including vendor quality manuals. Applying the statistical process control (SPC) methods for analyzing the data to evaluate the current process and changes. Preparing and presenting the technical and program information to the Management team. Directing the technical and administrative workers engaged in the quality assurance activities. 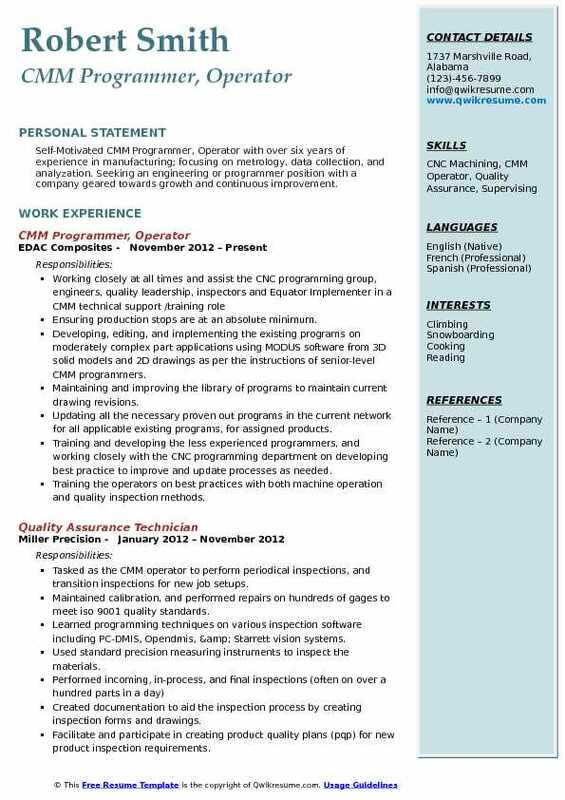 Headline : Sr. CMM Programmer with 6 years of experience is seeking to pursue opportunities which would best utilize and challenge my problem solving and technical skills. Received and bought the parts that return from outside process. Verified the specs and customer requirements. Wrote the programs and inspected the parts under strict deadlines to meet customer requirements. Inspected a wide variety of Aerospace components at all stages of production. Provided support and training to quality team members on various inspection methods and applications of reverse engineering. Worked closely with R&D and Manufacturing Engineers to verify complex contours on precision-machined parts and sub- assemblies using computer aided measuring arms. Performed supplier audits, first article inspection review of the incoming components. Developed quality assurance inspection and test requirements for automated CMM programming on-line and off. Worked with the Engineering team to resolve any quality issues that arised, and took part in improvement. Created an Excel report to analyze measurements to determine what fixtures was best fitted to meet drawing standards. 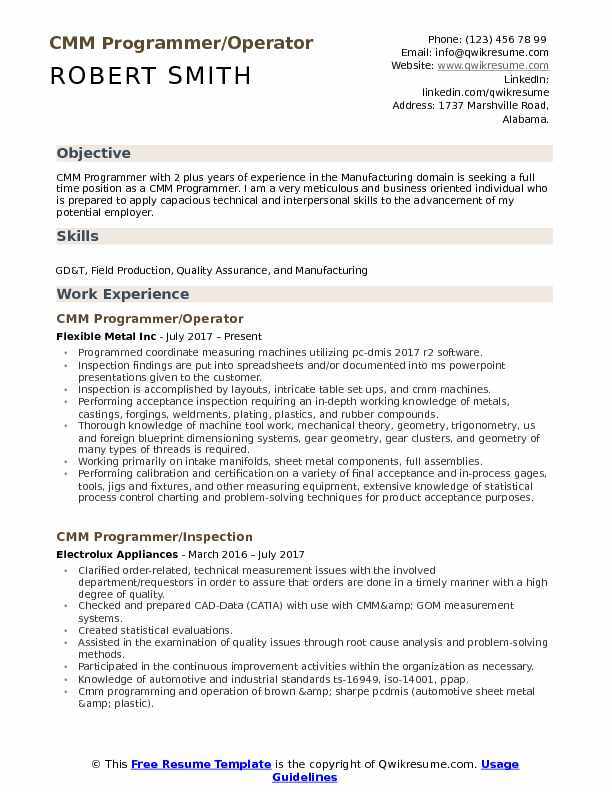 Headline : Self-Motivated CMM Programmer, Operator with over six years of experience in manufacturing; focusing on metrology, data collection, and analyzation. 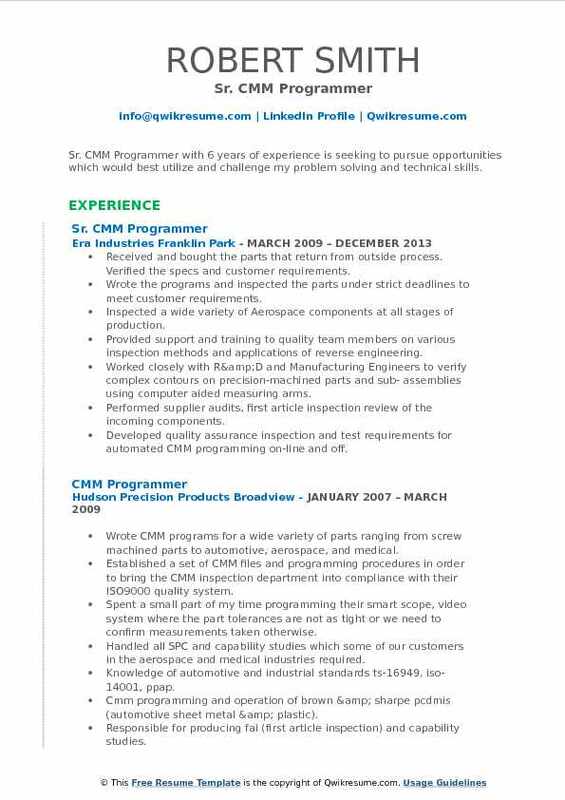 Seeking an engineering or programmer position with a company geared towards growth and continuous improvement. Ensuring production stops are at an absolute minimum. Developing, editing, and implementing the existing programs on moderately complex part applications using MODUS software from 3D solid models and 2D drawings as per the instructions of senior-level CMM programmers. Maintaining and improving the library of programs to maintain current drawing revisions. Updating all the necessary proven out programs in the current network for all applicable existing programs, for assigned products. Training and developing the less experienced programmers, and working closely with the CNC programming department on developing best practice to improve and update processes as needed. Training the operators on best practices with both machine operation and quality inspection methods. Performing the surface plate layout and inspection using conventional measurement equipment as required for the production or operational needs. 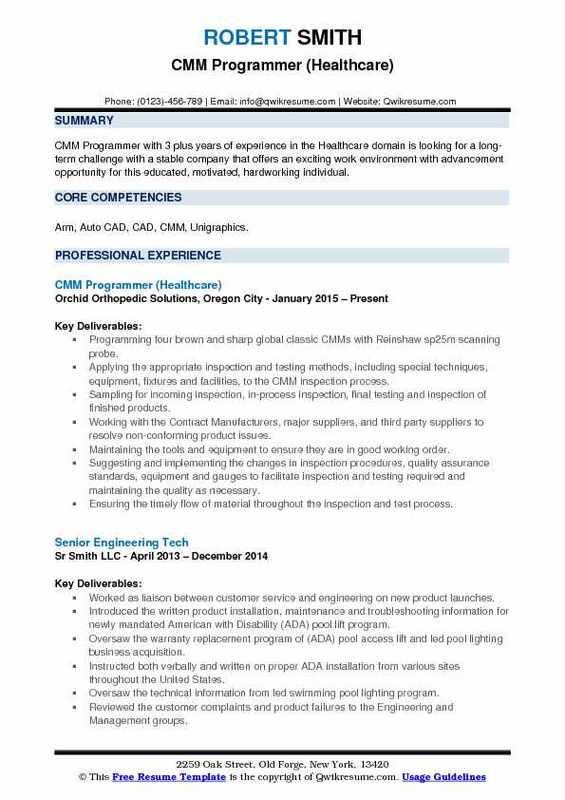 Objective : I am a CMM Operator with 2 plus years of experience. I have a solid understanding of GD&T, scanning techniques, various machine layouts (Vertically, Horizontally armed), and possess the ability to use all hand measurement tools. Performed professional Quality Engineering assignments of considerable complexity under limited direction supervision ie. conducted statistical analysis in the form of capability studies, DOE’s, etc to evaluate the processes. Designed, installed and continually evaluated the quality assurance and control methods and systems. Developed standards, procedures, and work instructions to provide quality guidance and to facilitate the training activities. Performed training in internal auditing, mechanical inspection, and statistical techniques. Developed sampling plans and statistical methods to be utilized for manufacturing and inspection in assessing the quality levels of products and processes to include determination of control points and charting methods. Interfaced with the engineering and CMM programmers, to design fixtures and processes to ensure the effectiveness of the measurement systems. Conducted the internal and external audits and supplier surveys to verify capability and compliance. Coordinated and participated in the material review activities to determine nonconforming product dispositions and corrective actions. Summary : CMM Programmer II with 16 plus years of experience is seeking to obtain a CMM Programmer or Quality Control Inspector position that will enable me to use my technical intellectual, strong organizational skills, and ability to work well with people. Programmed parts with Calypso software, set up automated & operated the CMMs. Utilized most hand held metrology equipment; micro hite, micrometer, caliper, functional gage to perform measured first article and incoming precision- oil & gas parts. Conducted both visual and dimensional measurement, several of casting, welding, plating and coating products inspected per specifications. Reviewed the material certifications, material test reports (MTR), and certification of conformance (C of C). Documented the inspection result finding, completed reports and logs, summarized & generated the nonconforming material reports (NCR). Practiced ISO procedures, lean six sigma, and practiced safety awareness. Wrote CMM inspection programs and operated CMM to collect data using PC-DMIS. Lead in training of CMM users to improve equipment reliability and operator level of knowledge. Supported the operators in troubleshooting daily issues with CMMs on shop floor. Summary : CMM Programmer I with 9 years of experience in the Manufacturing domain. My objective is to obtain a position in your company that will enable me to utilize my skills, experience, organizational skills, and personality to help maintain a quality organization. Performed layout inspection of parts, assemblies, and inspection fixtures and gages using the Coordinate Measuring Machine and appropriate measuring devices. Performed Gage Repair and Calibration. Maintained a priority schedule log for all request submitted layouts. Maintained the certifications of all gages and inspection instruments. Maintained a layout schedule for annual checking fixtures certifications. Performed Gage Repeatability & Reproducibility (GRR) Studies on checking fixtures as required. Provided the layout support for new program development and validation. Adhered to the customer layout standards, methodologies and requirements. Providesd layout inspection reports as required. Participated in the meetings with other departments to review data and developed the continuous improvement plans. Maintained safety and housekeeping practices in quality lab and lead by example. Promoted and facilitated the Open Door process, effective communication and Fair Treatment. 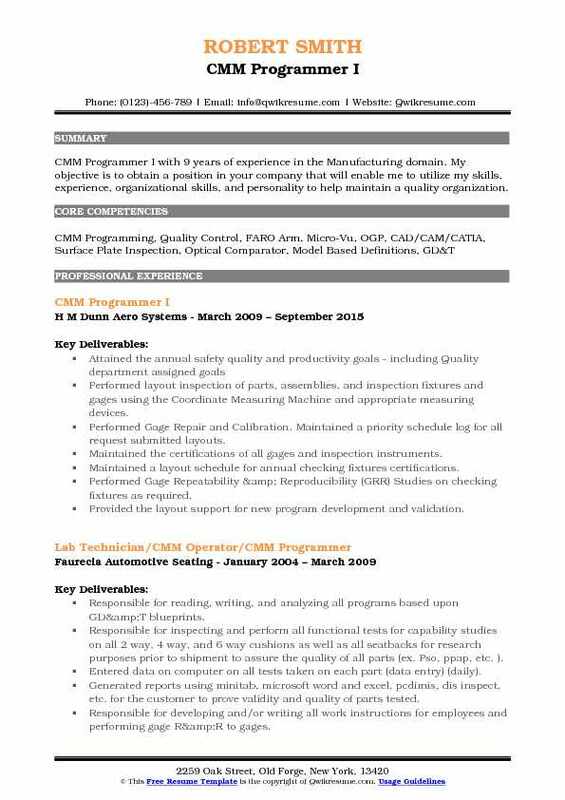 Objective : Entry Level CMM Programmer with 1 year of experience in the Manufacturing domain is seeking to secure a position that will provide a challenging career and where I can utilize my experience and facilitation skills to enhance a company's overall operation. Maintain, edit and update the current cmm pc-dmis programs for dimensional layouts. Performing inspections as required, reviewing and documenting the results, if any defects are noted, investigating/proving the findings to collaborate with the Management and develop a solution. Maintaining collaboration with both internal and external company representatives, providing input on technical matters pertaining to inspection methodology and responsibility. Interpreting, understanding and applying the methods established in complex technical documentation such as blueprints, specifications and applicable standards. Maintaining, performing and documenting the established calibration intervals on all inspection, measurement, and test equipment (IM&TE). Investigating the floor rejects for root cause and corrective action; Perform supplier audits, first article inspection review of incoming components. Investigating the rejects to determine if assembly process is the cause of failure. 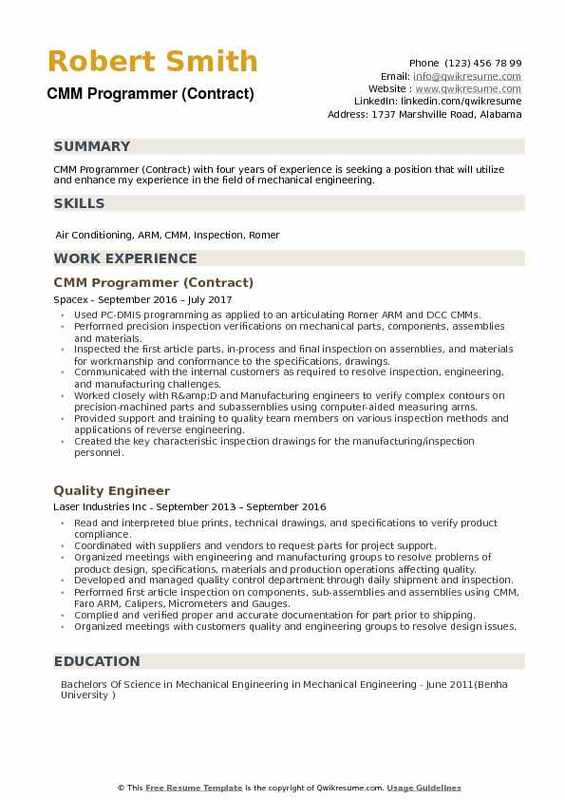 Objective : CMM Programmer (Contract) with four years of experience is seeking a position that will utilize and enhance my experience in the field of mechanical engineering. Used PC-DMIS programming as applied to an articulating Romer ARM and DCC CMMs. Performed precision inspection verifications on mechanical parts, components, assemblies and materials. Inspected the first article parts, in-process and final inspection on assemblies, and materials for workmanship and conformance to the specifications, drawings. Communicated with the internal customers as required to resolve inspection, engineering, and manufacturing challenges. Worked closely with R&D and Manufacturing engineers to verify complex contours on precision-machined parts and subassemblies using computer-aided measuring arms. Created the key characteristic inspection drawings for the manufacturing/inspection personnel. Performed the root cause and corrective action analysis for out of print parts, in line tests failures, and returned field units.